$15.00 Blank situational report form for mapcase insert. Original wartime issue, unused. $95.00 Wehrmacht Fuhrerschein, German Army Drivers License, named to Gefreiter. 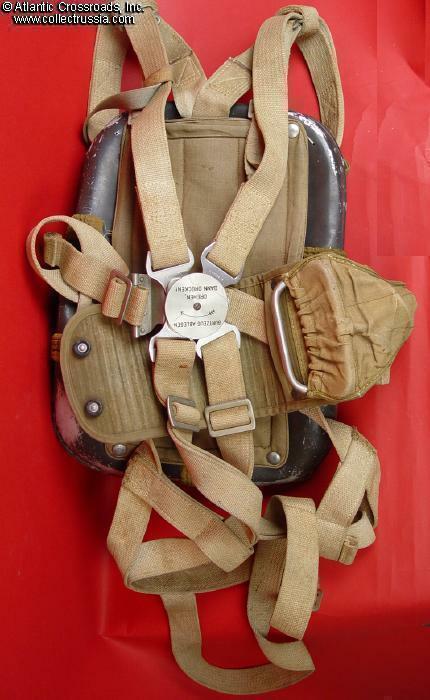 $4,650.00 Luftwaffe parachute harness, backpack type as used by FW190 figher pilots. Includes rip cord and all six bungees. $3,750.00 Luftwaffe parachute harness, backpack type as used by FW190 fighter pilots. $485.00 Wehrmacht or WSS EM cavalry boots. $34.00 Wehrmacht gas sheet bag in mint condition. $155.00 G-43 pouch, 1944 dated, in smooth black leather and white stitching. $145.00 G-43 pouch in smooth brown leather, with no visible markings. Unissued condition showing storage age only. $150.00 G-43 pouch in smooth brown leather, with Waffenamt mark. and 1944 date. $145.00 G-43 pouch in smooth brown leather, with Waffenamt mark. Unissued condition. $170.00 Large Luftwaffe square serving bowl, Kolmar manufactured, 1942 dated. 10 7/8" x 11", 3 1/8" deep. $165.00 Luftwaffe issue square serving bowl, 1941 dated. Smaller size, about 8 1/2" x 8 3/8" x 3", manufactured by famous Rosenthal company. Slightly chipped bottom corner but still serviceable.